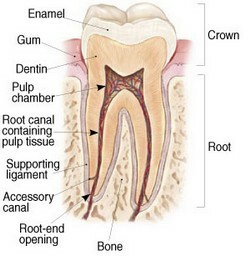 What is endodontic treatment? or What is a Root Canal? 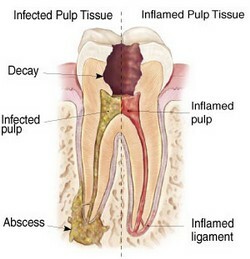 The endodontist removes the inflamed or infected pulp, carefully cleans and shapes the inside of the canal, a channel inside the root, then fills and seals the space. Afterwards, you will return to your dentist, who will often place a crown or other restoration on the tooth to protect and restore it to full function. After restoration, the tooth continues to function like any other tooth. Oral pain such as toothaches or cracked / fractured teeth can often be difficult to pinpoint. Because of the vast network of nerves in the mouth, the pain of a damaged or diseased tooth can be felt in another tooth and/or in the head, neck, or ear. An endodontist is a specialist in diagnosing and treating this type of pain. Occasionally a tooth that has undergone endodontic, treatment fails to heal or pain continues despite therapy. Although rare, sometimes a tooth initially responds to root canal therapy but becomes painful or diseased months or years later. New trauma, deep decay, or a loose, cracked or broken filling can cause new infection in your tooth. When any of these situations occur, the tooth often can be maintained with a second endodontic treatment and/or endodontic surgery. For the first few days after treatment, your tooth may feel sensitive, especially if there was pain or infection before the procedure. This discomfort can usually be relieved with over-the-counter or prescription medications. We will go over post operative care at the end of the appointment. Your tooth may continue to feel slightly different from your other teeth for some time after your endodontic treatment is completed. However, if you have severe pain or pressure or pain that lasts more than a week , please call the office.